Households in both the U.S. and Canada were hard hit by the global financial crisis, as shown by the large losses in the average balance of mutual funds and stocks. The wealth declines in the U.S., and most of the wealth gains in Canada, are entirely attributable to the housing market. The housing crash in the U.S. was the root cause of substantial wealth losses. Canada, in contrast, did not suffer a major hit to its housing market, although some speculate that they are also in a housing bubble that is about to burst. On many measures, the U.S. average is well above the Canadian average: Canadian wealth is more tied to housing; U.S. households have larger cash deposits, stock holdings, and disposable income; and U.S. households have less non-mortgage debt. In fact, the average Canadian household’s non-mortgage debt increased $8,000 between 2006 and 2011 while the U.S. average barely changed. This study compares the average Canadian net worth ($363,202) to average American net worth ($319,970). Averages are very sensitive to the highs and lows of a distribution, and are typically not used when comparing highly skewed distributions, such as income and wealth. In fact, using averages can provide wildly different numbers about the same population, while median values tend to be more consistent. For example, both the Survey of Income and Program Participation (SIPP), conducted by the Census Bureau, and the Survey of Consumer Finances (SCF), conducted by the Federal Reserve Board, try to capture U.S. household income, assets, and debts. Although they capture slightly different elements of household wealth portfolios, the main difference between the surveys is that the SIPP focuses on lower-income populations while the SCF makes a concerted effort to include extremely wealthy Americans in its sample. The results from 2010 wealth data? The average American household’s net worth was $206,600 in the SIPP and $498,800 in the SCF. Because the SIPP underestimates wealthy families and underestimates their wealth, its estimates of average wealth are significantly lower than those produced by the SCF. In contrast, median values are much less affected by variation at the extreme end of the distribution: median net worth in 2010 was $68,900 in the SIPP data and $77,300 in the SCF. When we look at the median wealth values from the most current, comparable survey data, the wealth advantage of our northern neighbors is no longer a recent phenomenon. In the 2005 Canadian Survey of Financial Security, Canadian households had a median net worth of just over $120,000 USD. In comparison, the 2004 Survey of Consumer Finances reported American households had a median net worth of just over $96,000. So, there was a median wealth gap of nearly $25,000 seven years ago. Given the recent substantial declines in median American wealth due to the burst of the housing bubble (and the Canadian wealth growth driven by housing gains), it is likely that the median gaps have grown since 2005. How is it that the U.S. historically had greater average net worth while simultaneously having lower median net worth than Canada? Simple: wealth in the U.S. is more heavily concentrated than it is in Canada. While wealth is highly unequally distributed in both countries, it is less unequal in Canada. 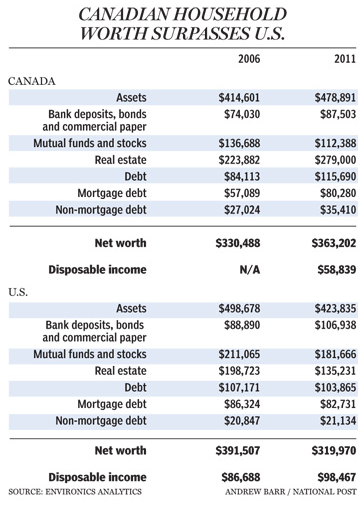 Credit Suisse’s 2011 Global Wealth Report shows that the bottom 50 percent of Canadians hold 5.4% of the country’s wealth, more than double the proportion of U.S. wealth (2.5%) held by the bottom 50 percent of Americans (Table 1-4). While this may be the first time in recent history that the average Canadian household’s net worth has surpassed the average American household, a closer look at the data suggests that the prior U.S. advantage reflected greater inequality in our distribution of wealth. When we look at medians, a better indicator of the “average” (i.e. prototypical) household, it becomes clear that Canadian households have been wealthier than U.S. households for at least 7 years. These gaps have most likely increased in recent years, as household wealth for middle- and upper-middle-class Americans has yet to rebound from the large losses brought on by the housing crash and recession.